Important Note: An optional CD is available with the reproducible book pages! Ages 4 through 9. 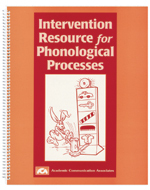 This comprehensive resource includes all the materials you need to develop individualized programs for children with poor speech intelligibility. The activities target syllable reduction, velar fronting, stopping, cluster reduction, stridency deletion, and liquid deviations. Reproducible materials include visually-appealing noun pictures, action scenes, game activities, and word lists for auditory bombardment. Basic Word Practice Exercises. Pictures, word lists, and activities are included for each speech pattern. The words on the worksheets may be used for auditory bombardment or for production practice. Play-A-Game Worksheets. Game worksheets are included for individual phonological processes. Students name the words and use the words in sentences. Students move their markers on a gameboard each time that the target pattern is used correctly. The activities are highly motivated and can be sent home for additional practice. The CD includes ONLY the reproducible pages from the book. You also need the printed book for the flip-page activities. The pages on the CD are in a PDF format that can be used if you have Adobe Reader on your computer. This program is available at no charge from www.adobe.com. The CD makes it easy to print out copies of the reproducible book pages. When ordering on the internet, use the drop-down menu to select one of the two product options.